Description: Thelocactus bicolor var. texensis is an invalid name published by Backeberg in 1962 applying to a Texas form, however, such Texas plants show no significant differences from other Texas specimens, plants fitting Backeberg's description cannot be set off from the variety schottii, but intergrade with the others and must be included within that variety, so this does not seem a valid basis for a variety, and the name probably should be dropped. Habit: It is a globular usually solitary cactus. Stem: Globose, ovoidal or slightly pyramidal, 8-20 cm tall, 5-12 cm wide. Central spines: 3-4, long, ochre to reddish, straight, acicular, the upper one often very long, somewhat flattened and papery. Radial spines: 8-18, 10-30 mm long, ochre to reddish, straight or slightly bent inwards, acicular. Flowers: 55-110 mm wide, magenta with a red throat. Blooming season: Early spring to autumn. 2) Goettsch, B.K., Heil, K., Terry, M. & Corral-Díaz, R. 2013. Thelocactus bicolor. In: IUCN 2013. "IUCN Red List of Threatened Species." Version 2013.2. <www.iucnredlist.org>. Downloaded on 11 January 2014. 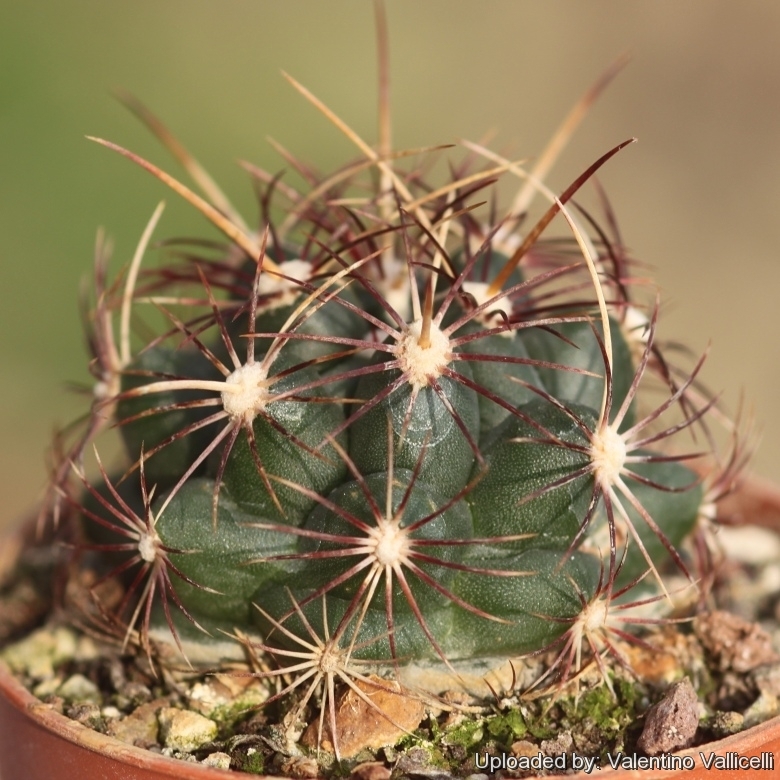 Cultivation and Propagation: Thelocactus bicolor is a summer grower species easy to cultivate, more cold tolerant than most and less fussy regarding soil conditions. Propagation: From seed, since the plant rarely produces plantlets.. Seeds germinate in 7-14 days at 21-27° C in spring, remove gradually the glass cover as soon the plants will be well rooted (ca 1-2 weeks) and keep ventilated, no full sun for young plants!